Now Aaron Paul will be embracing the iconic Netflix knock in the new ‘Breaking Bad’ movie, an expansion of the ‘Breaking Bad’ universe. It was announced today by Deadline that the project could be split between AMC Networks and Netflix. It is not yet known if it will be a film or limited series broken into two halves. It is an interesting approach that I think could frustrate some fans that may not have both cable and Netflix to binge the content. But we will have to wait and see what the strategy is when something is officially announced. 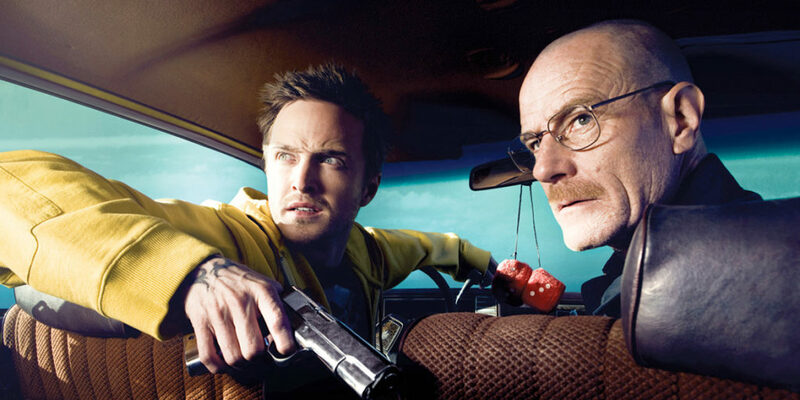 The film will be written and directed by ‘Breaking Bad’ creator/executive producer Vince Gilligan, who also co-created and executive produces ‘Better Call Saul.’ Vince Gilligan did attribute some success of the show to Netflix during his 2013 Emmy speech so a collaboration makes some sense. “I think Netflix kept us on the air,” he said back then. “Not only are we standing up here, I don’t think our show would have even lasted beyond Season 2. … It’s a new era in television, and we’ve been very fortunate to reap the benefits.” Coincidental Aaron Paul’s character wasn’t suppose to last past season 2 – until re-writes lead to him becoming a main character. While we don’t know the exact details around the project it has been speculated that it would pick up where the series finale left us hanging and follow Aaron Paul’s character Jesse Pinkman. The bigger question, is will Bryan Cranston be making a return? Back in November,Cranston confirmed the movie was happening but said that he had not seen a script. All but guaranteeing him having some part in the project. No word yet on a release date. More details on this as it develops.